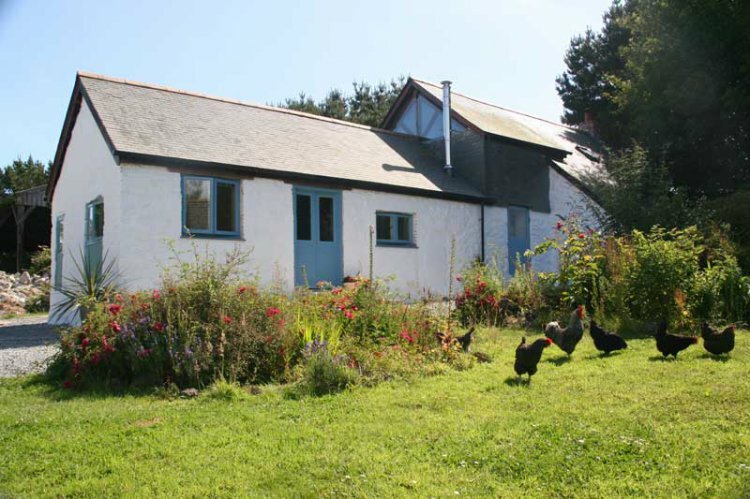 Set on an organic farm in the peaceful hamlet of Ruan Major, yet offering easy access to the picturesque villages and coastline of The Lizard and beyond, Barn Cottage offers light, spacious detached accommodation for six people with outdoor seating area. Cadgwith Cove with its thatched cottages and fishing boats is just two miles away and spectacular Kynance Cove a mere three miles. Guests are welcome to explore the farm (Soil Association registered) with its rare breeds, free range chickens, vegetable garden and acres of broadleaf woodland planted with 3000 English trees. Run according to conservation and ecological principles, the farm is a participant in the RSPB Farmers’ Alliance and a dedicated sanctuary and conservation area for rare birds and other wildlife. Barn Cottage has two entrances with large granite steps and off-road parking for two vehicles. The property features large larch and oak timbers and steel tensioned roof structures, an open-plan kitchen and dining room (8m x 4m) with a range of appliances (ceramic hob, cooker, hood, dishwasher, washing machine, microwave, fridge freezer). The lounge area has a large sofa, armchairs and large futon. There are separate feature pine staircases leading to each of the upstairs bedrooms – one twin, one double which includes a single bed (making a family room). Each bedroom has bedside tables with lamps, wardrobe and chest of drawers. Downstairs is a twin bedroom with its own hallway entrance and shower room with shower, toilet and wash hand basin. Furniture throughout is of very high quality with solid wood items including handcrafted oak tables and mahogany chests. The main bathroom features a handmade stained glass window. Heating is provided by two radiators and two wood burning stoves with complimentary basket of wood. Extra wood is available for purchase, as are organic eggs and vegetables. Up to four dogs are welcome,but must be kept on a lead near to the animals. A field for sole use of exercising dogs off the lead is available.